As I mentioned in my first Service Saturday post, the Hubs and I desire to instill a passion for service in our children. We hope that in providing several kid-friendly opportunities to love Christ by loving others, we can help our children find their own ministry passions. This month's service opportunity was inspired by my mother who after receiving an encouraging card from an elderly church member many years ago, decided that this was a wonderful way to share God's love to those around her. Her elderly friend has long since passed away, but my mom has been faithfully carrying the torch of this ministry for about ten years now. Every few weeks finds her at the post office with a handful of handmade postcards addressed to various folks in her church and surrounding community. Although I had hopes of buying a set of Make Your Own Postcards at our local Christian bookstore, I came up dry and had to go to plan B. I found a tear pad style "love note" pack called Joy Notes for Kids. Each sheep-themed note includes an encouraging phrase or an uplifting Bible verse. I cut post card shaped pieces of cardstock, drew a vertical line down each card dividing it into "address" and "note" sections. When we sat down to write our notes, we each brainstormed a small handful of folks who have ministered to us in some way. Then, we picked sheets from the "Joy Notes" that we thought would be appropriate for each of our chosen recipients. We glued the notes to the front of the card stock and began writing. While Sweetie Pea was able to write her notes without any assistance, Super Boy dictated a "form letter" to me, I wrote it out on a white board for him, and he used this example to copy the note onto each card. One of our goals in introducing these various service projects is to provide opportunities for ALL of the children to participate, not matter what their age or ability. So, although they could not write an actual word of encouragement, Blonde Warrior and Greased Lightening were able to color pictures on the letter half of the card. I, later, wrote a note over top of their design. We had a nice discussion about how it would make us feel to receive an encouraging note for no apparent reason...and we all agreed that this would be a worthwhile ministry to continue throughout the coming years. What a lovely thing to do for someone, and a great way to teach the kids to be compassionate! Sometimes a kind word (or note) can make a real difference for someone. Excellent! Kindness and a soft word are totally understated in our "me"-based society. Great to see someone rising above the world's standards. Visiting from HipHSMoms Hop. 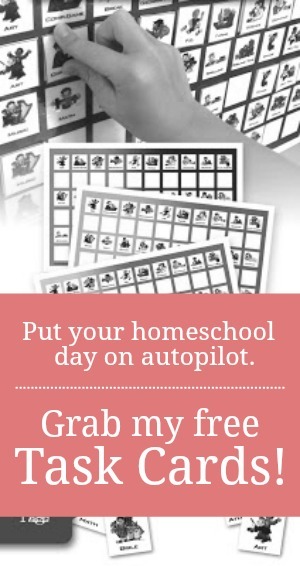 Have a blessed homeschooling day. What an awesome idea, I love this!! What a sweet, simple way to be an encouragement to someone, thank you for sharing!